Fever is a very common condition which is characterized by an elevated body temperature (above 36.6-37). Most of us experience fever during viral or bacterial diseases like colds or the flu, scarlatina, chicken pox, measles, etc., as well as when we have certain allergic reactions or when we suffer from an insect bite, especially bee stings. In addition, sometimes high fevers can be caused by extreme dehydration or overexertion. Fever is quite a normal reaction of our body on various infections, allergies or toxic invasions, and an elevated body temperature usually means that out immune system works fine. As a result of an increased body temperature, the production of white blood cells increases and their infection-fighting abilities also increase. 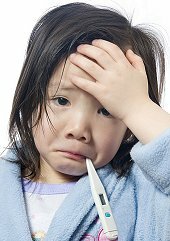 When a fever is too very high or lasts for too long periods of time, there are certain dangers (especially in babies and children), so in such cases the elevated body temperature should be put down immediately. There are many known instant medications for this problem, but sometimes people need something 100% natural. That’s when the most effective herbal remedies for fever may come in handy. Cantip tea or enema are among the most commonly recommended ones, as these herbal preparations induce sweating, warm up and help to calm down and relax. Echinacea is another common medicinal herb which can assist in lowering an elevated body temperature: it is possible to use this medicinal plant the form of tea or tincture. One of the simplest and the most effective ways to lower body temperature is wiping the hands, legs and face of the person who suffers from a high fever with a cloth dipped into some apple cider vinegar. Some herbalists would recommend combining thyme and licorice root in order to lower a high body temperature. Other effective herbal remedies for fever include tea of yarrow flowers, elderflower tea, peppermint tea, pineapple juice, apple juice and ginger root tea (the latter is known for its excellent warming effects, this way stimulating sweating and calming the symptoms of a common cold). This entry was posted 8 years, 7 months ago.